Platelet-rich plasma (PRP) therapy involves using your body’s own blood and your own platelets (small , round, thin blood cells that help blood to stop flowing from a cut by becoming thick and sticky) to stimulate the body to repair , rebuild, and regenerate using your body’s own natural processes. Platelet-rich plasma (PRP) therapy has been used extensively by sports medicine physicians, orthopedic surgeons, oral surgeons, plastic surgeons for over 20 years. More recently there has been much excitement around the use of PRP for a number of aesthetic conditions. It is being used for the face, neck, hand and body, and is becoming the latest trend in facial rejuvenation, known as PRP facial rejuvenation. 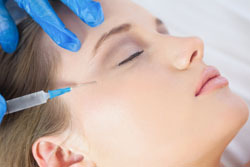 WHAT ARE THE AESTHETIC BENEFITS OF PRP? Doctors take a small vial of the patient’s blood, drawn from the forearm in a special patented blood tube, and then spun in a special centrifuge at very high speeds to separate the platelets from the red blood cells. The centrifuge separates out and concentrates the platelets into what is referred to as the “platelet-rich plasma” (PRP). The PRP is then activated with a solution that is natural to your own body and re-injected into the face, neck, hands, or body in order achieve a regenerative effect by stimulating collagen and elastin production and the formation of new blood vessels. The growth factors that the platelets naturally release initiate a wound healing cascade that gradually increase collagen which can increase the thickness and overall health of the skin leading to skin rejuvenation. PRP is given via an injection using very fine needles. The treatment is not painful. Topical or local anesthetics are administered prior to the injections and there is usually no pain after the procedure. Because the PRP is processed from your own blood, there is no risk of allergy or rejection with this treatment. Redness, minor bruising or swelling that may last a week. Because we are using a very natural process to regenerate collagen, longevity of the results depends on the proper care of the skin. Better results can be expected as more treatments are received. 2-3 treatments will help results last up to 18 months. Minimal improvement is expected for those who smoke, use alcohol or drugs. CAN IT BE COMINED WITH OTHER PROCEDURES? Yes. The PRP procedure can be combined with Botox, dermal fillers, laser therapy and facial surgery. Hair thinning or hair loss may occur as a natural part of aging, due to medications, poor diet (lack of important nutrients in the diet), heredity, male pattern baldness, hormonal changes associated with pregnancy, menopausal changes, emotional stress, illness, injury, or disease. PRP for hair rejuvenation is still considered experimental; however, patients are experiencing hair growth and hair thickening. There is increased hair density and decreased hair shedding. Results of less hair shedding are seen within 8 weeks with peak effect at 4-6 months. Increased hair density has been seen in Androgenic alopecia and Telogen Effluvium. A 2013 scientific article by the American Society for Dermatologic Surgery reports that Platelet-rich plasma (PRP) containing various growth factors has attracted attention in various medical fields. PRP has recently been used during hair transplantation to increase hair density. The objective of this study was to: “ investigate the effects of PRP on hair follicle (HF) reconstitution”. The conclusion of the study is that: “a considerable effect of PRP on the time of hair formation and the yield of HF reconstitution was observed in this study ” with the advice to doctors to do further studies to investigate the mechanism of action of PRP. Also, a new independent study, by Gilbert Amgar, MD and Pierre Bouhanna, MD, Paris, France, demonstrates “New” hair growth and “Denser” hair with PRP for Androgenic Alopecia. PRP for hair rejuvenation involves drawing blood, then spinning the blood in a special centrifuge at very high speeds, then separating the blood, to concentrate platelets,into what’s called Platelet-Rich Plasma (PRP). The PRP is then activated and then micro-injections are then made in the scalp to stimulate hair growth. It works extremely well in combination with low level laser therapy and LED lights to grow new healthy hair and slow down or reverse hair thinning and hair loss by increasing blood flow to the area of treatment and stimulating and energizing the hair follicles. 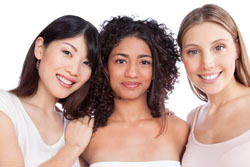 Together, you and Dr. ChinQuee may decide if PRP is right for you. Call to schedule an appointment for a consultation.